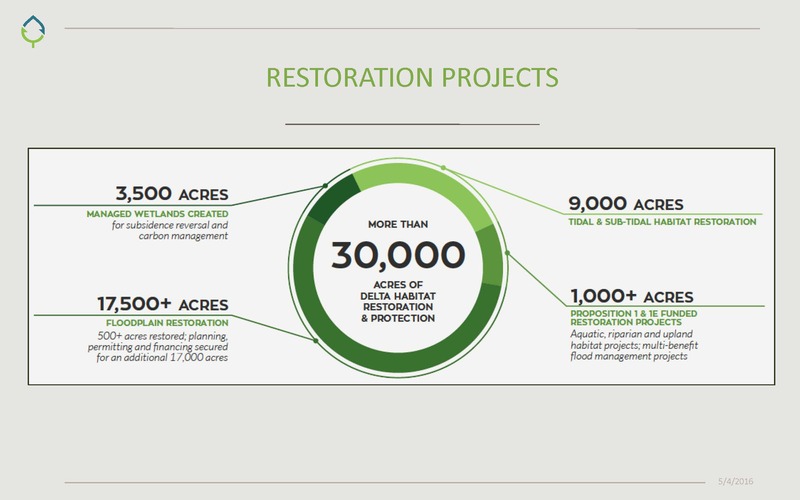 California EcoRestore is the Brown Administration’s initiative to help coordinate and advance at least 30,000 acres of critical habitat restoration in the Delta by 2020. Announced in April of 2015, the program has been in operation just slightly over one year. 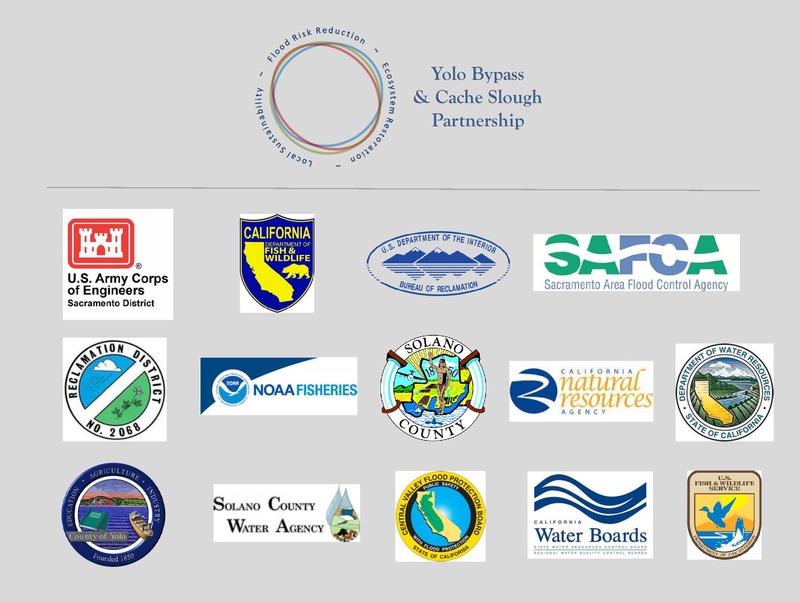 At the spring meeting of the Delta Plan Interagency Implementation Committee, a committee comprised of eighteen heads of the state, federal, and local agencies that are responsible for implementation of the Delta Plan, David Okita and Kristopher Tjernell from the California Natural Resources Agency provided an overview of the progress made so far, and highlighting the success of the collaborative Yolo Bypass and Cache Slough Partnership. 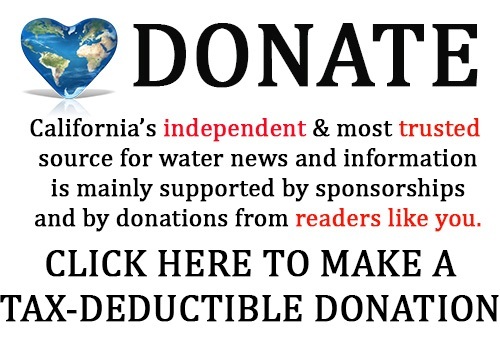 David Okita began the presentation with an overview of the progress made on the California Eco Restore Program, which has been underway for about a year now. Mr. Okita said there are three components to the Eco Restore program: the restoration projects, planning, and adaptive management. 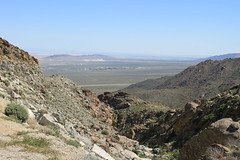 The main goal of the program is to have 30,000 acres of habitat restoration in the next three to four years. 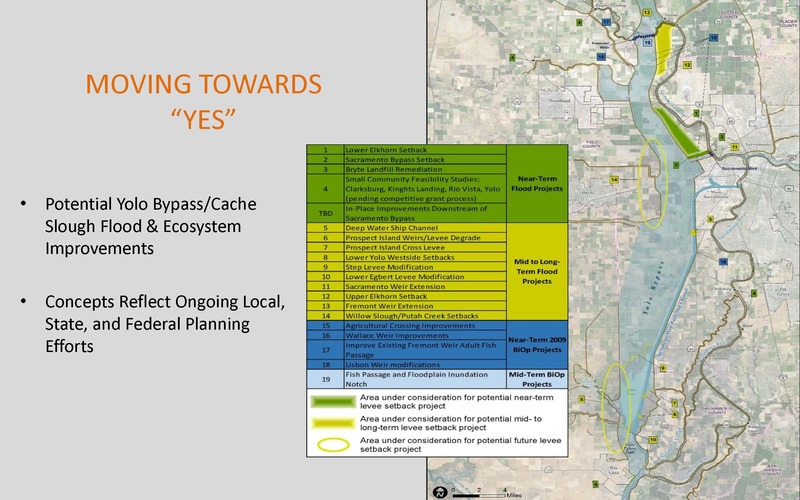 In addition to the acreage targets, there are fish passage projects in the Yolo Bypass which are particularly important for winter-run salmon, as well as shaded riparian habitat in the Delta which is measured in lineal feet rather than acreages, he said. 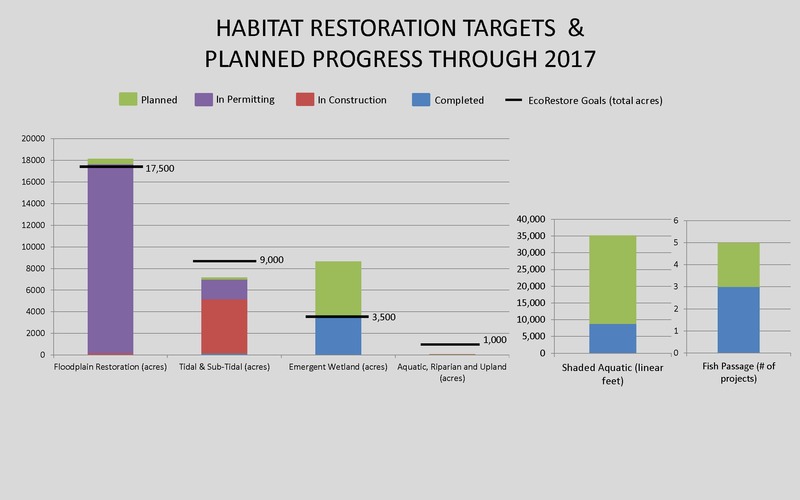 Mr. Okita then presented a chart showing planned progress towards habitat restoration goals through 2016, noting that the first bar represents floodplain restoration, the second tidal, the third emergent wetlands, and the fourth aquatic riparian habitat and other miscellaneous habitats; the two bars on the far right are shaded aquatic habitat which is measured in feet and fish passage projects which are measured in number of projects. And with that, Mr. Okita turned it over to Mr. Tjernell. Mr. Tjernell began by noting this is his fourth time in front of the Delta Plan Interagency Implementation Committee, and that his focus during those presentations was why they were pursuing integrated ecosystem restoration projects with flood projects in ways that work for local agricultural communities, and why the state should take an active leadership role in working with local partners and federal partners to improve coordination. 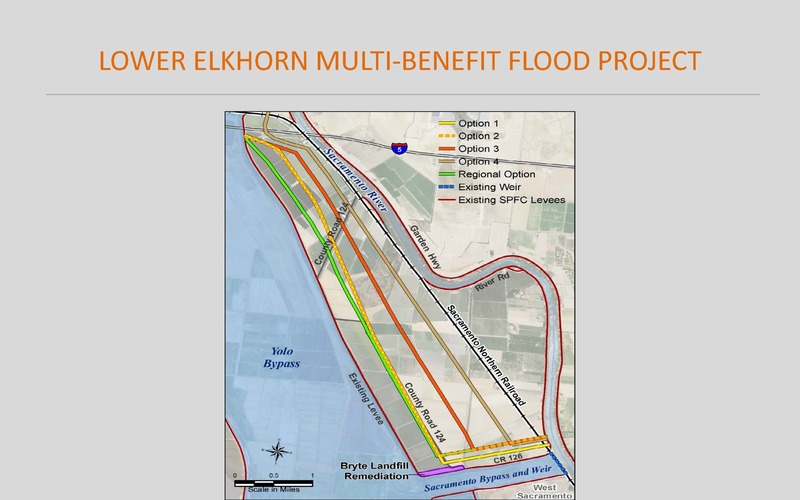 He then presented a map showing 19 projects planned for the Yolo Bypass, pointing out the Wallace Weir Fish Passage Project (#16) and the Lower Elkhorn Levee Setback Project (#1, #2, and #3, the green shaded area). “All the projects will benefit from the increased coordination that we’re talking about, but these two I want to focus on because of the near term progress that’s been made,” he said. 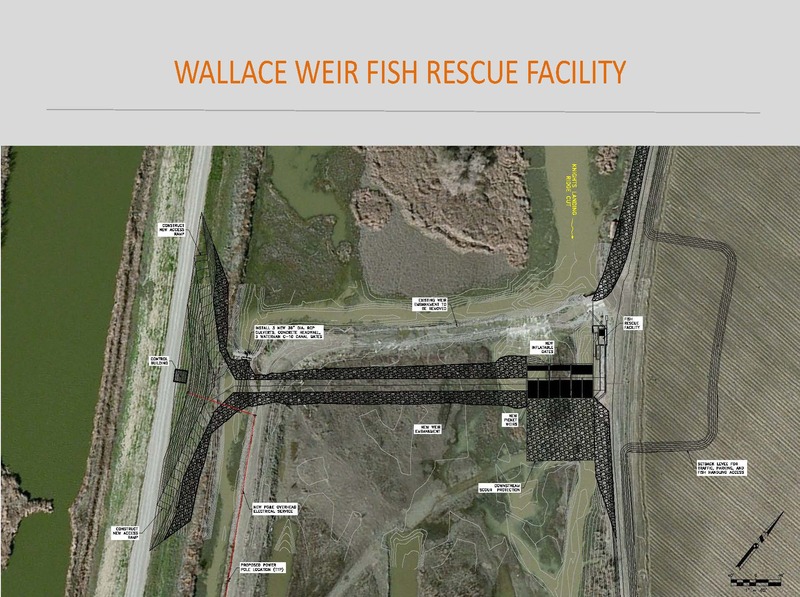 The purpose of the Wallace Weir Fish Rescue Facility is to block adult winter-run salmon from going the wrong direction as they make their journey back to their spawning grounds. 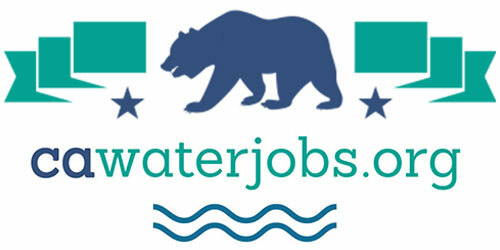 Click here to visit the EcoRestore program website. Click here for a three-page handout. 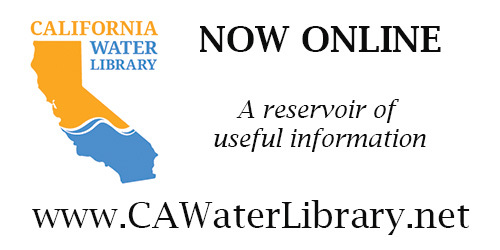 Click here for the agenda and meeting materials for the May 9th meeting of the Delta Plan Interagency Implementation Committee. 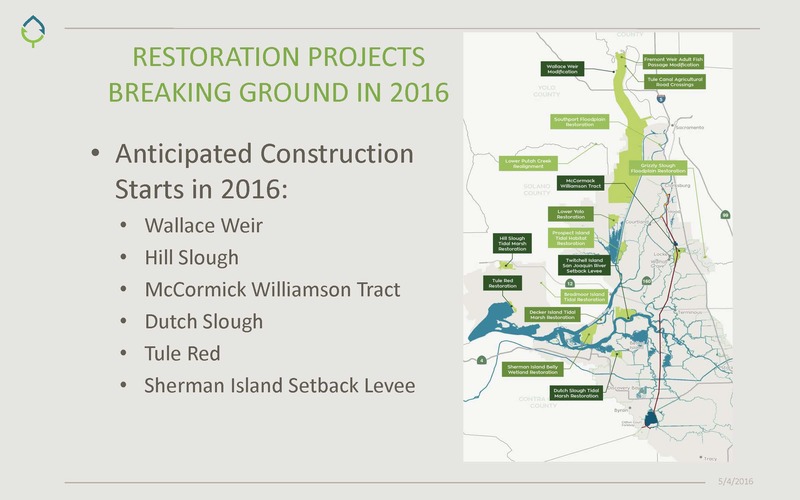 I think it is wonderful that efforts are being made in regards to restoration. Very informative post, I look forward to hearing more about this project. Thank you for sharing!